Players jog, low & high skip, jockey, side step in and around the grid with regualar changes in direction and speed. 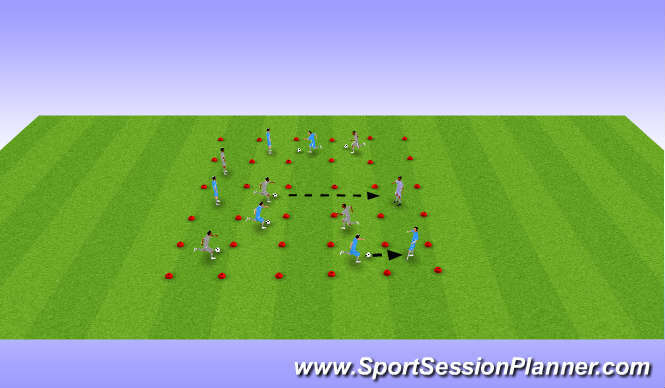 Players then have 3 balls per team and must pass to another team mate in another square. Players then perform x 12 Lunges on each leg and repeat. Progression - Players can only pass the ball to a team mate if there in a free grid. Players then perform x12 Squats and repeat. Players then perform x12 lateral lunges on each leg and repeat. Progression - In order for players to make a pass teh ball must travel through two grids before reaching the other player. Finally leg swings, lateral leg swings and knee drives. 1. Players weave in and out of poles,when they reach the last pole on command they run must turn out and run either left or right around the designanted pole then walk back to the line, this is repeated twice. 2.As above players must weave through the 6 poles, once the direction has been called players must sprint around the pole and sprint back toward the final far pole, this is repeated twice. 3.As above player weave in and out out the poles but when they reach the last poles players must back pedal around the designated pole then spint out towards the final far pole, this is repeated twice. 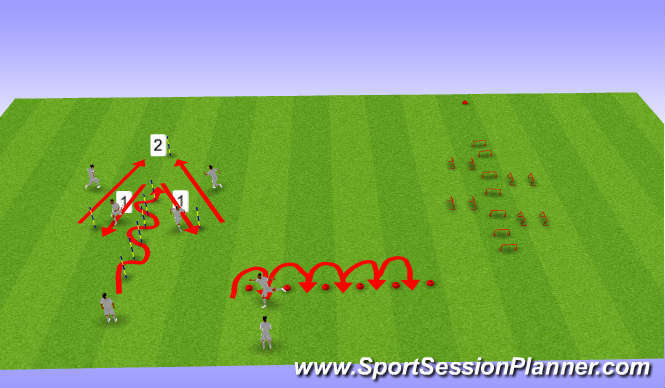 Players start on the first cone then turn out and around the cone and perform a volley this is then repeated through all 5 cones then partners switch. player perform this drill again but with the opposite foot the 2nd time round this is then repeated twice. Players jump 2 footed throughout over hurdle, jump over 2 right and back, jump forward again, 2 two the left and back, then forward and right and back, forward, left than back and finally forwards and sprint to the cone (3 times). This is then repeated but lateral steps instead of two footed jumps (3times).